The Bicentennial version of Eisenhower Dollars was coined at the US Mint in 1975 and 1976. However, these coins do not reflect those dates; they are dual-dated 1776-1976 to celebrate the 200th anniversary of American Independence. The obverse of the coin is identical to the original design, with the exception of the dual date. 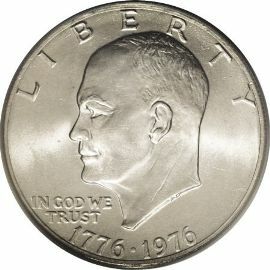 It shows a left facing portrait of the late president Dwight D Eisenhower along with the inscriptions "LIBERTY" around the top, and "IN GOD WE TRUST" under Eisenhower’s chin. 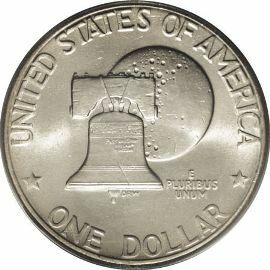 The reverse of the coin was changed from an American eagle landing on the moon, to a Liberty Bell superimposed over the moon. Also surrounding the entire design are the inscriptions "UNITED STATES OF AMERICA" and the denomination “ONE DOLLAR".